Thad Cochran wasn’t supposed to win this one. Had he played by the normal rules of Mississippi politics he would be working on his golf game. But the senior Senator from the Magnolia State broke the rules. The calculus leading up to this unlikely electoral victory is complicated. Moderate Republicans, desperate to deprive Tea Party insurgents of a big symbolic win, poured millions of dollars into this primary contest. Chamber of Commerce people backed Cochran to the hilt because, unlike the volatile Chris McDaniel, he was a known quantity. But there is one simple explanation for a traditional conservative walking away with a narrow victory–he got out the black vote. Runoff turnout in the 24 counties with a black population of 50 percent or more was up almost 40 percent from the primary. In all other counties, turnout was up just 16 percent. Without these crossover voters, Cochran would have gone down to the kind of stunning defeat that most people (myself included) were predicting. Black voters were betting that, although McDaniel would have been more vulnerable to a Democratic challenger in the fall, it was highly unlikely that Mississippi was going to elect a blue senator under any circumstances. In that case, it was best to go with the devil you know. 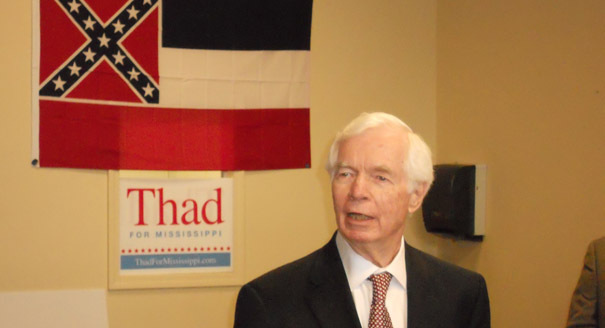 It is highly significant that Thad Cochran went out of his way to court black Democrats, adopting a distinctly moderate tone in the final weeks of the election. That has McDaniel and his supporters hopping mad. It has been a long time since a white Republican candidate courted the black electorate in the great state of Mississippi. From their perspective (though they can’t say it out loud) Cochran is a race traitor. The fact that the election results coincided with the American Experience program on Freedom Summer underscored the irony of this development. Are we witnessing the emergence of a new political coalition comprised of pragmatic black Democrats and moderate Republicans? Probably not. But whenever a traditional conservative faces off against a Tea Party politician like McDaniel, strange political bed fellows will crawl under the sheets once again. It will be interesting to see if Mr. Cochran, assuming he is elected in the general election, will remember that his moderated stance in the last days of his campaign enabled him to continue as senator. Really he has nothing to lose. It is highly unlikely he would run for another term. He will be 84 if he serves out his term, again assuming he is elected in the general. That assumption might not be valid. The TPers may be so angry that they just stay home in November. U.S. Senator Interviewed with “Southern Partisan” magazine. 3rd Quarter Vol. 15, page 32. Some highlights from the interview I include after my comment. Ironically Cochran was saved by African American voters whose voting rights he was against. Southern Partisan: Well, the South continues to be singled out in respect to Federal Civil Rights legislation, for example; do you think this is still justified? Southern Partisan: You mentioned of course, that a lot of changes have taken place in the South, still some things remain; the Confederate Battle Flag for example; that is part of the state flag in Mississippi, are you comfortable with it? Cochran: I don’t think Congress ought to decide. I think it is strictly up to the state legislature of Mississippi, and if I were a member of the legislature I would vote to keep the flag as it is. Cochran: I think it is unfortunate that some have used it in a way that it raised questions about their views. but our state, I think, has demonstrated by our actions that it is not a racist state. We have full rights and participation in all the political processes. It’s a decision the Mississippi state legislature has made, and I respect their decision. Southern Partisan: Do you favor stronger roles in state government? Cochran: I think states have been mistreated in the extent that the federal government has usurped the responsibilities that many of us think are the rights of the states or are more properly vested in state government. We are seeing a transition back to, I think, some of those notions of states’ rights and the Tenth Amendment, which protects the privacy of states by preventing usurpation by the federal government. Race traitor? A traitor to the human race? One of the most interesting things I have noticed is how quickly “race” is brought up by those who claim to be colorblind. This was nothing more than politics as usual. “Walkin’ around” money was dispersed to apathetic voters and the result was that those voters followed through by voting for the one who bought their vote. I don’t blame the politicians as much as I blame the voters. If they just follow marching orders from political hacks, then they will continue to have no one to blame but themselves. As far as crossing over to vote Republican, let’s look at the results in November to see the permanence of this shift. By the way, I’m glad you can see into the hearts of individuals and determine what their views on this subject are. Maybe they can’t say “race traitor” because that concept doesn’t enter their minds.